During periods of high intensity physical activity our bodies work hard to maintain blood oxygen levels. When heavy breathing does not produce enough oxygen, the body will begin to source the oxygen internally through a process known as Anaerobic Respiration. Cramping and muscle fatigue result when the glycogen in Oxygen-starved blood transforms into lactic acid. By introducing more oxygen, the blood is able to inhibit the production of lactic acid and expel any existing already. Professional athletes know first-hand about the toll their sport can take on them – the impact it makes on their bodies, and the benefits of using Boost Oxygen as a supplement to help reach peak performance and recover faster. Boost Oxygen is 95% pure Oxygen, all-natural and safe. According to the World Anti-Doping Association (WADA), supplemental Oxygen is not considered a banned substance. 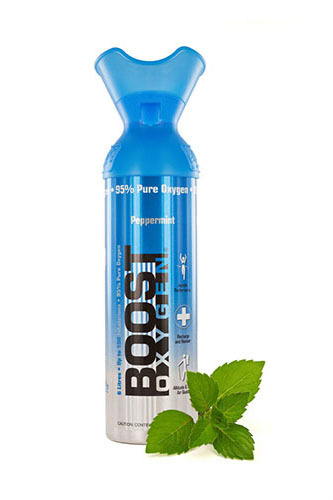 For peak performance and speedy recovery, try Boost Oxygen’s 650ml can in Peppermint. During strenuous activity, take three-to-five inhalations before an event, three-to-five during a rest period, and three-to-five at the end to speed up recovery and stay in peak condition.